The FS MOBILE APP lets you dimension and document palletized freight from any Apple or Android phone or tablet. It’s perfect for low-volume shippers that need an easy, low-cost way to collect NTEP-certified dimensions and multiple photos of freight in just a few minutes. Download the app for free today and see how it works for your business. The FS MOBILE APP delivers consistent, NTEP-certified measurements in just a few simple steps. Use it to measure both cubic and irregular-shaped palletized freight before it goes out to your carrier. 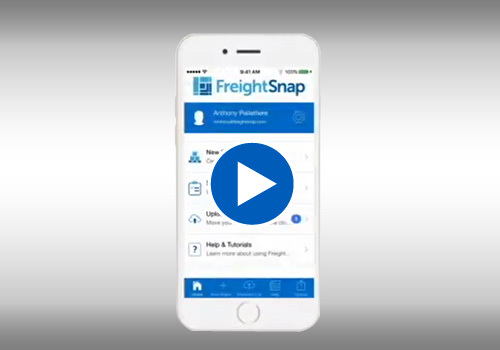 Width: 72" | Height: 72" | Length: 72"
Width: 24" | Height: 24" | Length: 24"
The FS MOBILE APP gives companies that only ship a handful of pallets per day an easy way to dimension and catalog their palletized freight in just a few simple steps. And while it doesn’t make use of any 3D measurement technology like our automated dimensioners, it does offer a few of the same performance features. After you’ve measured and photographed your freight using the app, you’ll want somewhere to store that information so it can be accessed later. Our solution is Amazon’s secure S3 Cloud Storage platform, which is a protected repository for all your shipments. To look at dimensional data or photos of past shipments, just open up your “Shipment List” from within the app, or open your web browser and log into your account online. You can even generate reports of each shipment, which include the dimensions and photos of your freight, and share them with anybody you wish – all you need is their email.